Armando Llamas grew up in Argentina. From 1973 onwards he mainly lived in France. His style was described by a critic as somewhere between rock culture and action painting. His plays differed strongly from each other. He also translated work from Spanish and English into French. Llamas suffered from AIDS and died from a haemorrhage in Paris in 2003. Work: "Lisbeth est complètement pétée"; " Gustave n'est pas moderne,"; "No way, Veronica". 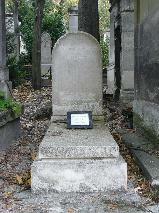 The grave of Armando Llamas at Père Lachaise, Paris.